Our garden backs onto the bush and as a result of that we do get a variety of creatures wander in, although they are somewhat restricted by the wooden fence. The larger goannas tend to not make it in, but smaller specimens do and we are always aware of their presence due to the reaction of the birds. Brown Honeyeaters are the most common of the honeyeater family in our garden and when a goanna is present they chatter away and we have to look to see what is bothering them. Many birds make an alarm call if they are uncomfortable about what is close by and only time and experience will enable you to understand the change in call. Even when travelling we have heard birds calling when we would not expect it and have discovered a threat nearby. When a Brown Goshawk enters our garden to drink or bathe there is a lot of chattering by the Brown Honeyeaters, but the Bar-shouldered Doves stand like statues hoping to not be seen! It looks absurd as they stand there motionless until one decides to make an escape! Even if a cat dares to come into our garden, despite the moth balls hanging around the perimeter to try and prevent them entering, the birds will chatter away rather than leave. They want the water and they are not going to let a cat interfere with what they need to survive. 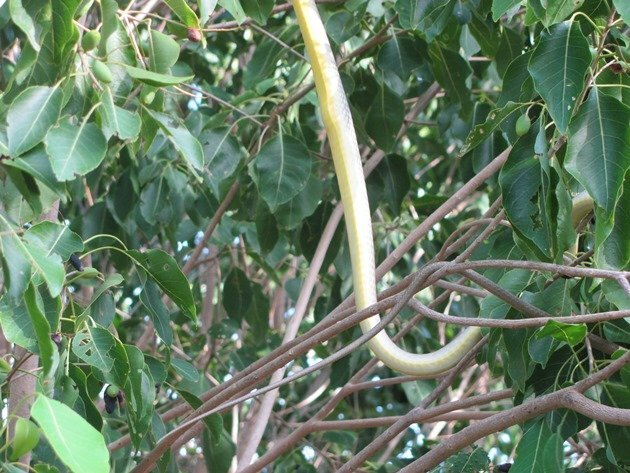 On Wednesday evening this week there was a new threat in our garden and it was only the second time that we had seen a Common Tree Snake in our garden. They may well have been in a lot more regularly that we know, because there is plenty of room for them to hide and if you are not home then anything could be roaming around! 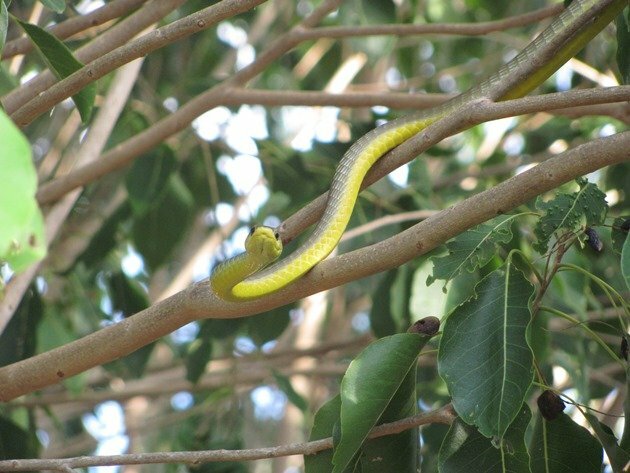 The Common Tree Snake Dendrelaphis punctulata is also known as a Green Tree Snake, but varies a lot in colour. This specimen was easily 120cm long and very agile. Not only that, but it was very beautiful and we were in awe rather than afraid. 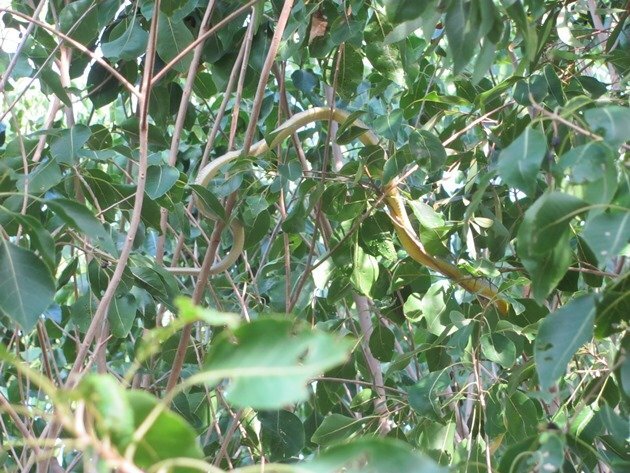 Common Tree Snakes are one of the few snakes in Australia that are not venomous, which may be a bit boring for some of you! 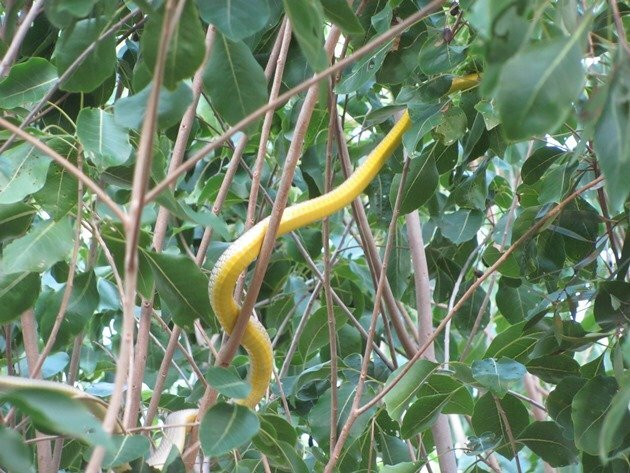 It was carefully manoeuvring around our large native tree Terminalia petiolaris directly over one of our watering points for the birds and as we approached carefully it actually moved towards us with its tongue out as if it was smelling us. 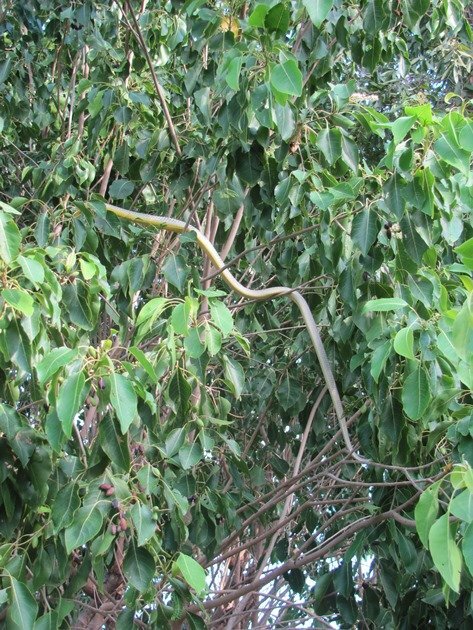 Note the Common Tree Snake goes up and around to the top of the photo and I cut some off! It then took itself higher up into the tree and it appeared to have eaten recently and needed a place to rest. 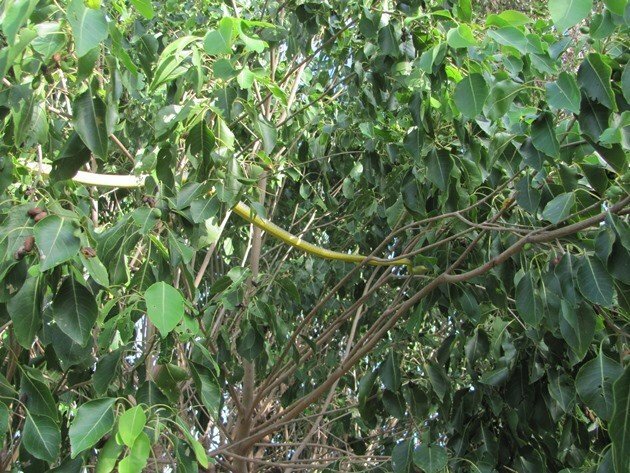 The Common Tree Snakes eat frogs, small reptiles and small mammals and due to their agility it would not be hard for them to capture something around here! 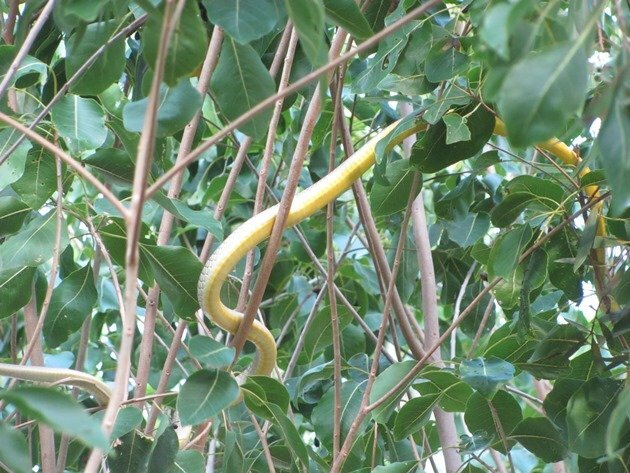 The colour of its underside was incredibly yellow allowing the camera to focus on it as it moved through the tree. It was interesting to watch the birds come into the tree and then realise it was there and move away. It eventually settled high up in the tree for the night. In the tree for the night! We were rather disappointed to see that the Common Tree Snake had moved on the next morning, but at least if it does return then we can rely on the birds to keep us informed of its presence! I’ve heard an interesting theory though why their bellies are bright yellow. 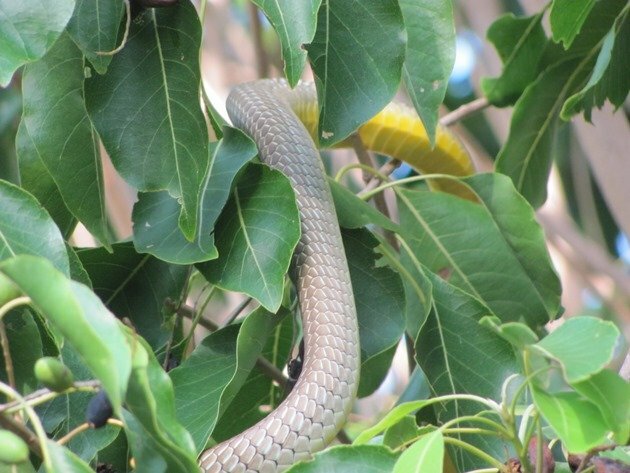 They have formed an alliance with death adders: the brown tree snake will move into a tree and behave conspiciously while the death adder will dig into the dry leaves at the base of the tree. 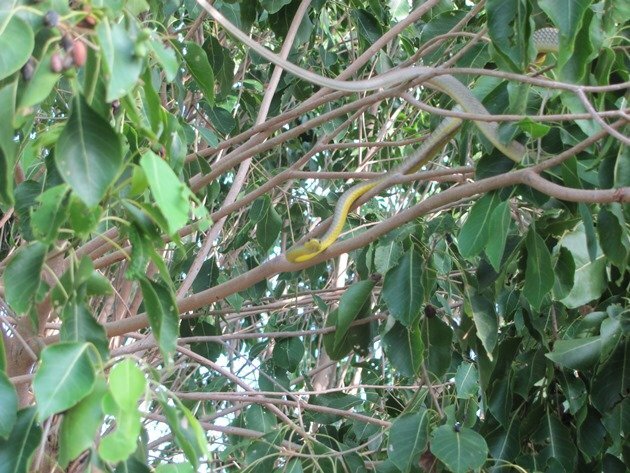 When unsuspecting birders in sandals walk up to the tree to marvel at the beautiful yellow belly of the tree snake – *wham* – bitten! So I’m going to need new boots.I would have been the first sucker to get bitten.